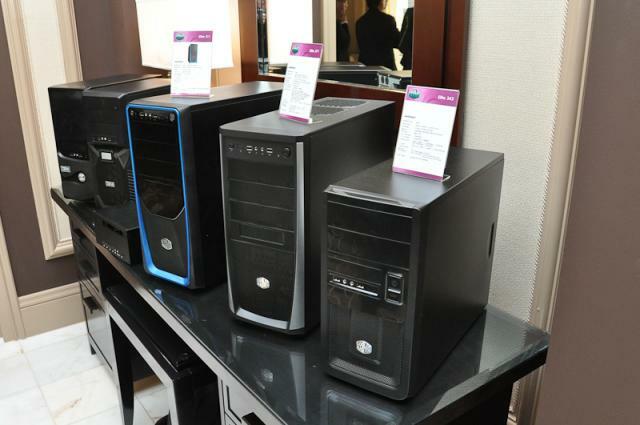 As the full day two of CES 2011 rolled around we had an appointment with Cooler Master this year. We've just started to review their products and currently have a power supply and a CPU heatsink on our test benches. This year we got to see a few of their latest released products as well as some stuff they are working on to release this coming year and beyond. We started with a look at their value cases. Most people associate Cooler Master with the enthusiast case market that can be a little expensive. They have a whole line of cases that are priced at $39. This makes it easy to get into a Cooler Master case for your next build. The other main case they were featuring was the Enforcer case. This is a pretty decent case that has a ton of features in a tidy-compact Mid-Tower package. It offers good cable management and provides the user with a clean build. As far as coolers go, Cooler Master has some pretty decent offerings on the market right now and there are more to come. They've got new models in their "V" series as well as a pretty slick 17" notebook cooler that also integrates a 4-port USB 3.0 hub. The cooler isn't cheap, but it does give you some great USB 3.0 expansion. Most notebooks only offer one or maybe two USB 3.0 ports maximum and as more devices utilize this standard, you'll need all the ports you can get. Cooler Master is looking into the watercooling arena and after seeing they upcoming offering - or at least some prototype hardware, it looks promising. They have put a lot of effort and engineering into their waterblock and the waffle pattern you see below on the right consists of many layers of the copper weave and should provide great heat transfer to the liquid. Cooler Master works with Choiix as well and they offer more consumer oriented products such as power adapters, portable power, speakers, holders and more. Also we took at took at some of their power supplies and we have a lot more pictures in the gallery. Day 2 CES Gallery is over here. Full CES 2011 Coverage is over here. Please post your thoughts, comments and questions in the forum at the "Comments" link below.